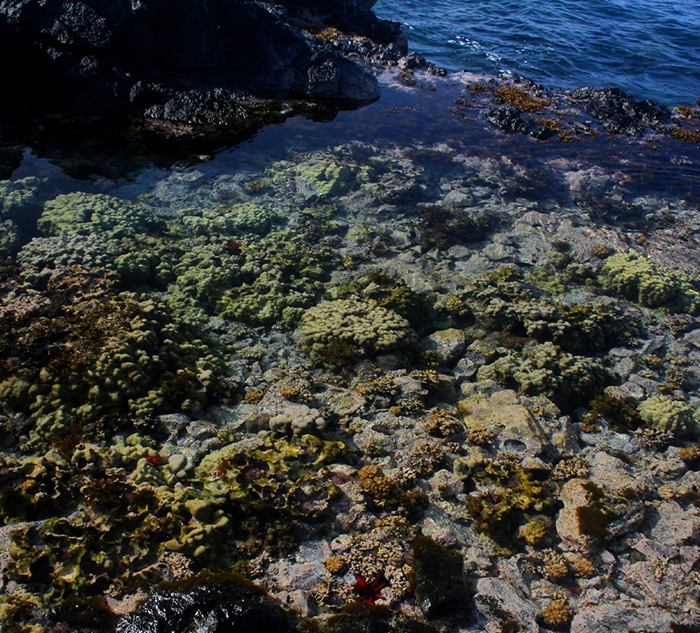 A Hawaiian tidepool packed with many stony corals. Long time hobbyists will recall the early days of reefkeeping when we were uncertain of the lighting requirements of corals. We assumed that mimicking the intensity of natural sunlight was the way to go, and many reefkeepers used 400-watt or even 1,000-watt metal halide lamps over shallow aquaria. Our understanding of zooxanthellae photosynthetic capabilities began to change in the late 1990’s when scientists published important information, including downregulation of photosynthesis at higher light levels, results of PAM fluorometry experiments, and genetic analyses of different zooxanthellae types or ‘clades’. Introduction of relatively inexpensive Quantum (or PAR) Meters allowed serious hobbyists to measure light intensity in their aquaria and compare results in a scientific metric. Still, many questions remain unanswered. Light requirements of zooxanthellae depend upon many factors. Some zooxanthellae ‘types’ are highly adaptable to light intensity but even then the amount of light required is dependent upon the history of exposure to sunlight. For many years I had wondered about the photosynthetic activity throughout the day of coral living in an extremely shallow environment. I suspected that the coral, or more correctly, its zooxanthellae would require a great deal of light to be at its peak efficiency. I had done similar work years ago with other corals, but they had been collected at greater depths. My small laboratory recently purchased a device that would answer my question – a Pulse Amplitude Modulation Fluorometer (or PAM fluorometer). This is a fancy name for an instrument that is, in essence, a photosynthesis meter. See Figure 1. Photosynthesis, as we know, is a link between the inorganic and organic worlds, where sunlight is harvested by photopigments (such as chlorophyll) and, in a series of complicated steps, oxygen is produced and carbon dioxide is converted to simple sugar. In a terrestrial environment, there are ‘sun’ plants and ‘shade’ plants to exploit various light fields. The same is true in aquatic worlds. Both environments share another commonality – photosynthesis is regulated in similar fashions. 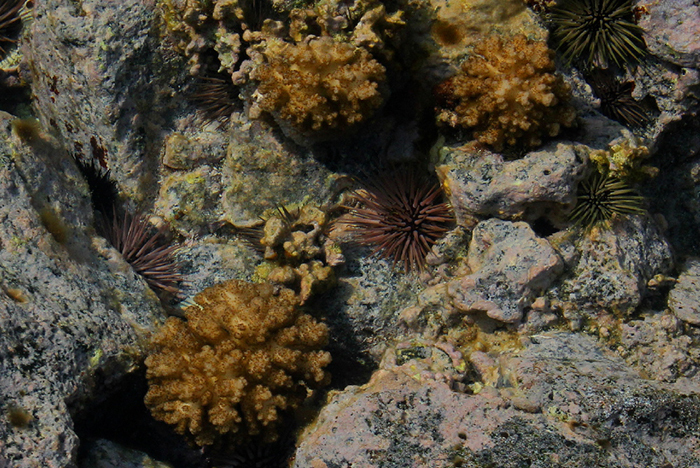 A colony of Pocillopora. Photo by Gary Parr. In low light, photopigments absorb much of the light falling upon them but as light intensity increases, chlorophyll begins to dump energy away from the photosystem through either fluorescence (in the red portion of the spectrum) or as non-radiant heat. 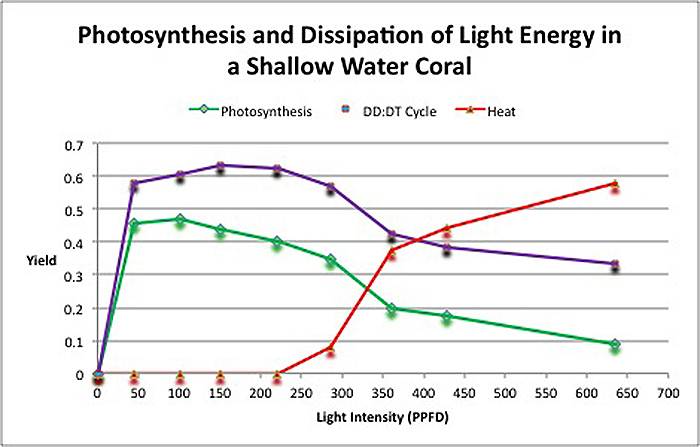 Hence, photosynthesis, far-red fluorescence (not to be confused with the colorful fluorescence of the coral animal), and heat are competing processes. A PAM fluorometer exploits these factors and reveals much about the kinetics of zooxanthellae photosynthesis. In short, the instrument analyzes data and tells us whether light is being used for photosynthesis or is being dumped away from the photosynthetic apparatus. There is some terminology we should understand in order to correctly interpret data generated through experimentation. These include: Clade: A group of things (such as zooxanthellae) sharing a common ancestor. Pocillopora specimens often contain Clade C zooxanthellae. Other common zooxanthellae clades are A, B, and D. Yield (Photosynthetic): The ratio of absorbed light particles (photons) to the number of electrons moving through a photosystem, determined by measuring chlorophyll fluorescence. Yields of zooxanthellae are generally lower than those of green plants (i.e., 0.40 to 0.80). Electron Transport Rate (ETR): Photons (particles of light) are collected by photopigments and then move through the photosynthetic process as electrons. The number of electrons moving through this process is the Electron Transport Rate, or ETR. Technically, this flow of electrons is reported as ‘µmol electrons·m²·sec’. The Electron Transport rate is calculated by multiplying the Yield by Light Intensity (PPFD, or PAR value). Photosynthetically Active Radiation or PAR: Radiation (either natural or artificially created) that falls within the range of 400 nanometers to 700 nanometers (violet to red light). It is reported as ‘µmol photons·m²·sec’ Photosynthesis/Irradiance (P/I) Curve: A P/I curve shows the relationship of photosynthesis and irradiance (light intensity). PPFD, or Photosynthetic Photon Flux Density: The number of photons (light particles) falling a given surface area in a given amount of time. Figure 1. 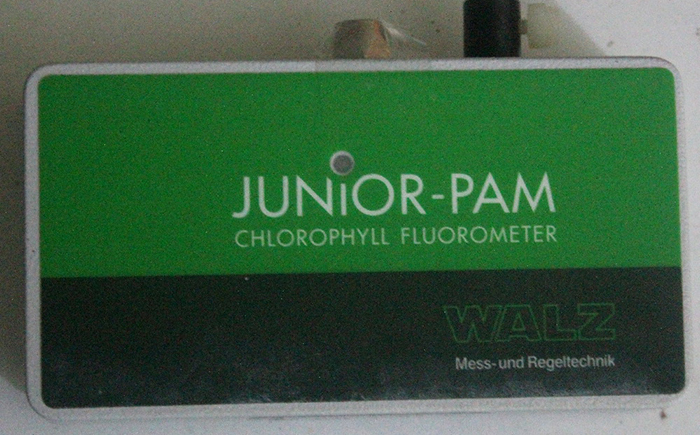 A PAM fluorometer. This deceptively simple looking device can unlock the secrets of coral photosynthesis. A fiber optic cable allows underwater measurements. Zooxanthellae (as well as many plants) have a protective pathway in place called the ‘Xanthophyll Cycle’. In zooxanthellae, two xanthophylls are involved: Diadinoxanthin and Diatoxanthin. Blue light is absorbed by diadinoxanthin which converts it to diatoxanthin (in darkness, the cycle reverses and diatoxanthin reverts to diadinoxanthin). There are various other names for this naturally occurring process – phycologists (those who study algae) call it Non-Photochemical Quenching (or NPQ), while others call it ‘Dynamic Photoinhibition’. Whatever the name, this xanthophyll cycle offers protection against high intensity light. However, the protection offered is not unlimited. When all diadinoxanthin is converted, the cycle offers no further protection. Figure 2 shows the absorbances of these two xanthophylls. Note that only blue light is involved in the conversion and it offers no protection from other wavelengths, especially red light. Figure 2. 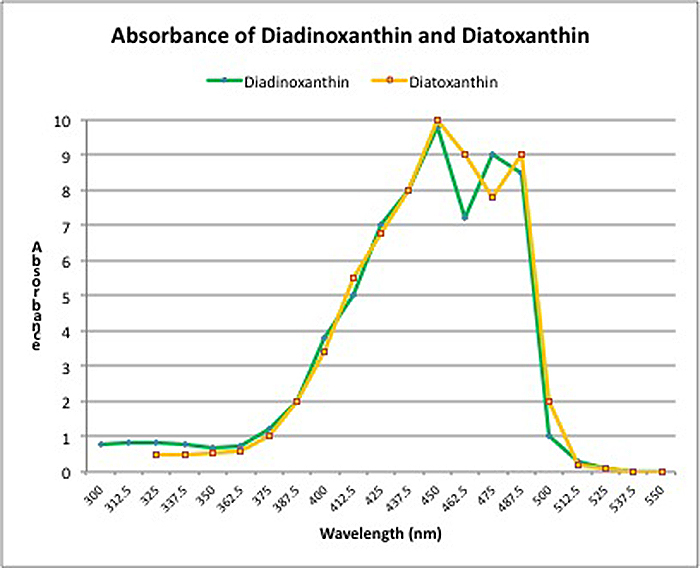 Absorbances of protective xanthophylls Diadinoxanthin and Diatoxanthin. Pocillopora damicornis – The Guinea Pig of the Stony Coral World Pocillopora damicornis was a favorite of coral researchers for many years (although it seems to be replaced nowadays by Acropora millepora). These corals have similar traits – they are abundant and easily collected and, with a little practice, are easily distinguished from other coral species. Pocillopora damicornis often lives in shallow tide pools here in Hawaii. They can be attractive (sometimes displaying green fluorescence or non-fluorescent pink or red coloration). Other specimens can be drab brown and their bumpy surfaces have earned them the nickname of the ‘wart coral’ (Pocillopora is Latin: pocillun meaning cup or bowl; and pora for porous or pore). These corals also breed easily in well-maintained aquaria (they are hermaphroditic brooders ejecting live young) and can become a nuisance due to their ‘weedy’ nature. Pocillopora species are closely related to other aquarium favorites such a Stylophora and Seriatopora. See Figure 3 for a P. damicornis photo. Figure 3. Pocillopora damicornis colonies adapted to life in this shallow water environment – just 5cm (~2 inches) deep. Results of the Experiment My major interest was to determine the light requirement of this little stony coral. Data were downloaded and a Photosynthesis/Irradiance Curve was prepared. The result clearly shows that maximum photosynthesis takes place at low light intensity such as that produced by many lighting options available to hobbyists (such as LEDs, and fluorescent & metal halide lamps). See Figure 4. Figure 4. 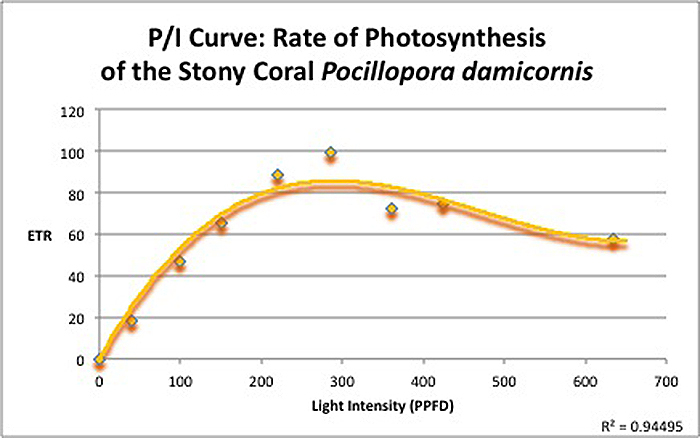 This Photosynthesis/Irradiance Curve shows this shallow water Pocillopora requires only ~200 µmol photons·m²·sec to be at a maximum rate of photosynthesis. The second portion of the testing involved observation of how light energy is dissipated. Recall that photosynthesis and pathways that dump light energy away from the photosynthetic apparatus found in zooxanthellae are competing processes. Figure 5 demonstrates that even at low light intensity, photosynthesis and the protective xanthophyll cycle absorb light energy. As light intensity increases, both of these processes begin to slow, and excess energy is shed as non-radiant heat. 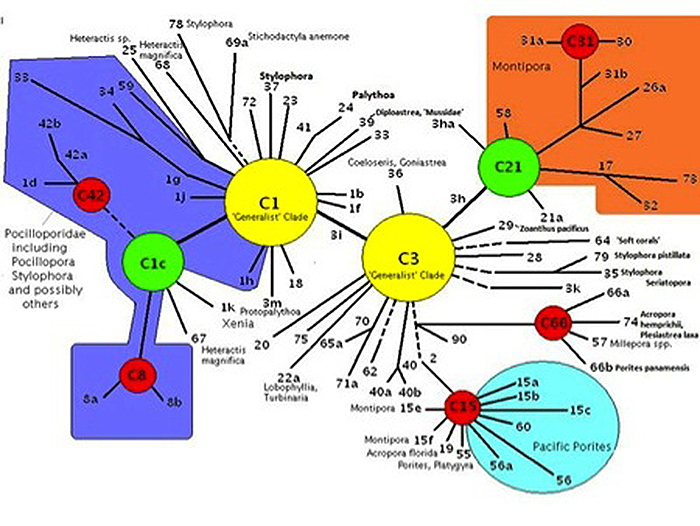 To the best of my knowledge, this is the first time this information about a coral and its symbiont’s pathways has been shown in a chart. Figure 5. 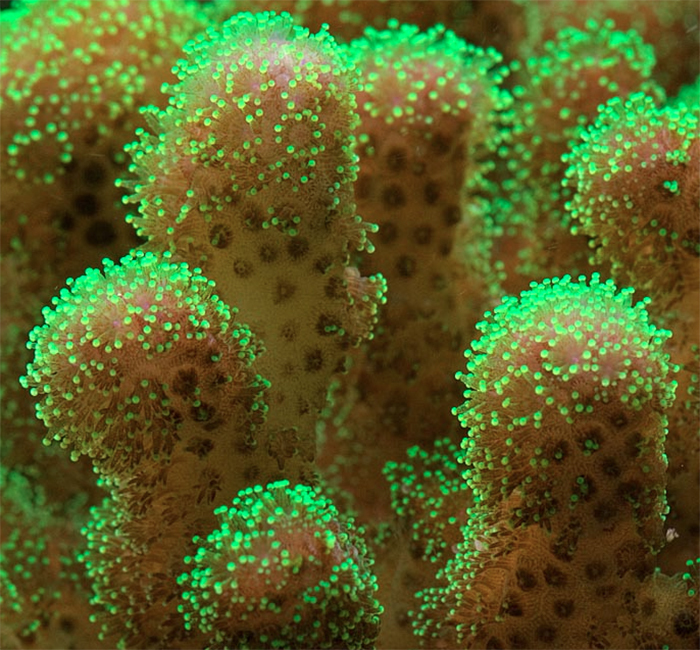 Fate of light energy in the stony coral Pocillopora damicornis. The yield of photosynthesis is initially high but drops with increasing intensity. The protective xanthophyll starts immediately but it too loses efficiency. At about 220 µmol electrons·m²·sec, zooxanthellae begin to dump excess light energy as non-radiant heat. Discussion It may come at a surprise to many that this shallow water Pocillopora specimen performs best photosynthetically when at light levels often seen in aquaria (at a light intensity (PPFD) of less than 300 µmol·m²·sec, or about 15,000 lux). In nature, this coral reaches photosaturation early in the morning and begins to regulate photosynthesis during most of the day. Although I did not reach recovery, other researchers have shown that the rate of photosynthesis rises late in the day when light intensity begins to drop. 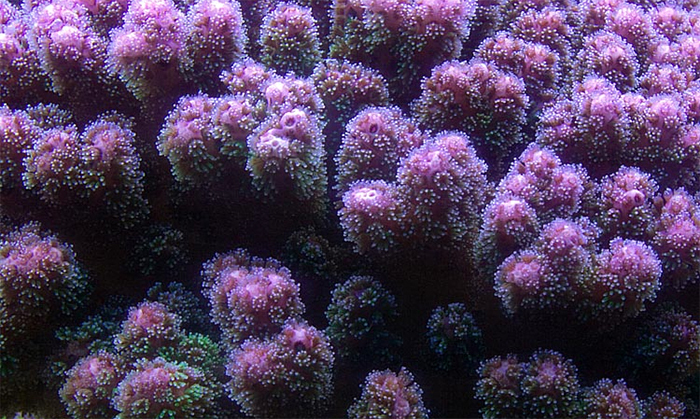 Another colony of Pocillopora. Photo by Gary Parr. The carry-home messages are clear. It is possible that well-meaning hobbyists could be over-lighting their aquaria. If we link the rate of photosynthesis to the coral’s growth rate, it is also possible that the effort to grow corals could be slowed (this especially important to coral farmers!). In addition, associated expenses (electrical usage, cooling, etc.) are needlessly high. An investment in a relatively inexpensive quantum (PAR) meter (such as those made and sold by Apogee Instruments, Logan, Utah) might be a wise investment. Pocillopora specimens in Hawaii contain zooxanthellae belonging to clade C (usually C1c or C1d). Figure 6 shows the phylogenetic relationship of clade C (with Pocilloporidae corals such as Seriatopora and Stylophora) bunched together in the violet-shaded portion to the left in the diagram). In general, clade C strains are less tolerant of high light as this report confirms. Figure 6. The relationship of various zooxanthellae ‘C’ clades. It is my intent to return to the mainland from Hawaii in a few years, and I look forward to continuation of research into the light requirements of corals. It would be easy to guess that other corals of Family Pocilloporidae would react in a similar manner, but only further research will confirm this. Now that I’ve discussed the science, I’ll add a couple of personal notes. I always try to remain open-minded and objective when working in the lab. Emotion has little place in science (unless a passion for the work can be included) but I was surprised at just how little light was needed by this coral. I learned a lot from these brief observations and that in itself is my true reward. I would love to hear any comments about this article. If you wish to communicate privately, my email address is RiddleLabs@aol.com.